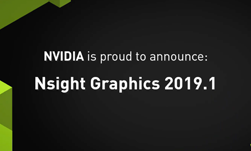 NVIDIA announces Nsight Graphics 2019.1.In this release, we add a new and exciting capability – GPU crash debugging with the alpha release of Nsight Aftermath. Additionally, we have added the capability to compare traces in GPU Trace, greatly enhanced the user experience in the debugging and profiling activities, and added support for D3D12! For full details on the new capabilities in the 2019.1 release, see our full release notes. 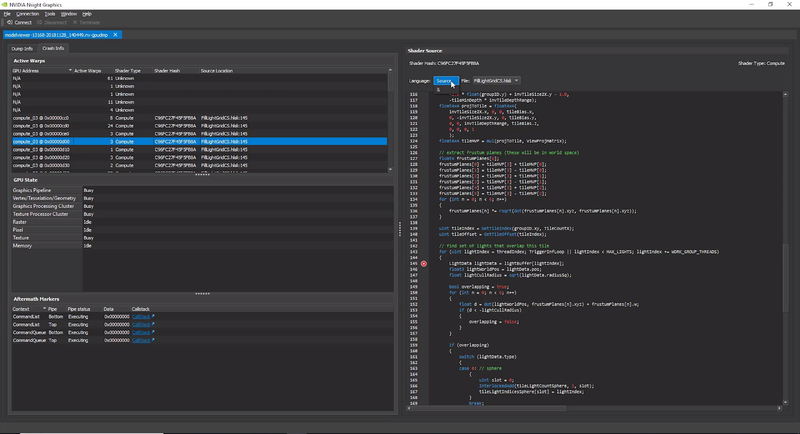 The alpha release of Nsight Aftermath is a new feature in Nsight Graphics that allows users to debug GPU hangs and crashes in their DirectX 12 applications. Additionally, Nsight Graphics offers an easy to use user interface for viewing these GPU crash dumps. If you are are running into Windows TDRs or other GPU crashes in your DirectX 12 applications, give the new Nsight Aftermath a try. You can find out more in the Nsight Aftermath announcement or in our helpful documentation on how to get started. 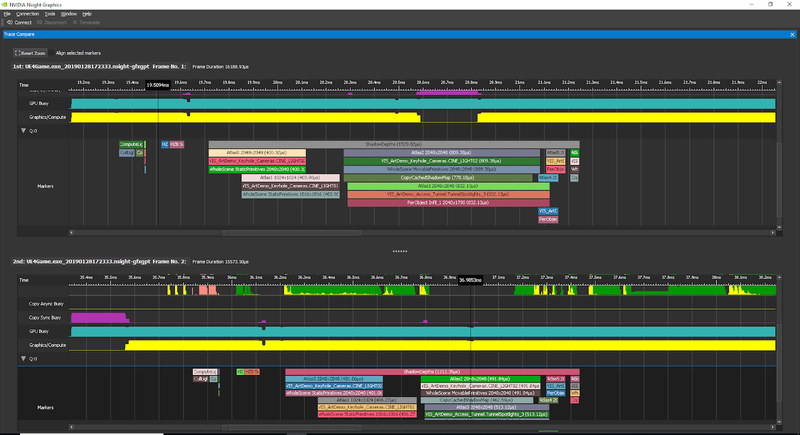 In this release, we continue to improve our GPU Trace activity by adding the ability for users to compare their traces. Users can select a combination of frames from a single trace or two different traces for side-by-side comparison. Additionally, events can be aligned to aide in the visual analysis of a trace – giving the user the ability to quickly assess the performance delta. In addition to new features, we have greatly improved the user experience in the frame debugging and frame profiling activities. 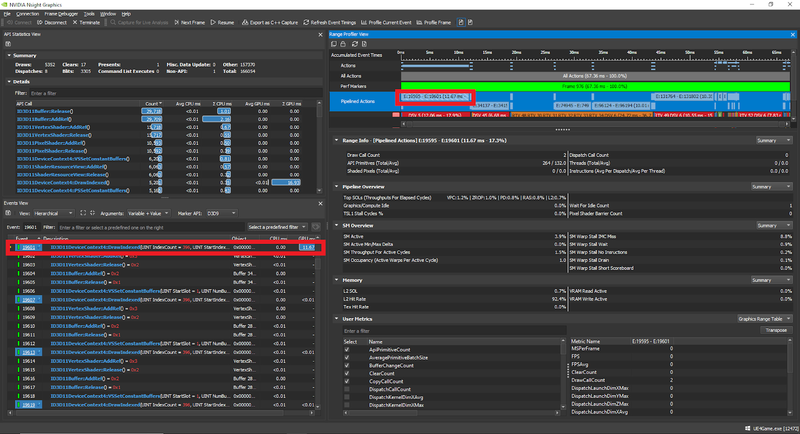 First, you will notice substantially faster UI response when browsing the scene with the scrubber, selecting resources in the resources view, and selecting events in the event viewer. Secondly, we have implemented a widely requested feature – linking between the range profiler and debug feature selection. For example, selecting a range in the range profiler will now set the current event to the last event in the range, which is reflected in the Scrubber, Events View, and the rest of the Frame Debugger UI. We have also added support for a new NVAPI – DirectX12 Meta-commands which allows users to profile applications utilizing DLSS technology. 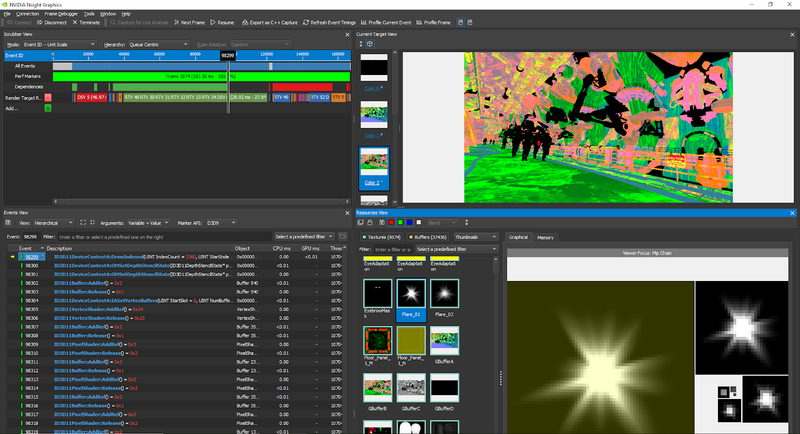 Try out the latest version of Nsight Graphics today!